Experts said the New England Journal of Medicine study was not conclusive as other hidden factors could be to blame. Researchers at Harvard Medical School and the University of California, in San Diego, looked at data collected over 32 years as part of a heart study. Author Professor Nicholas Christakis said: "It's not that obese or non-obese people simply find other similar people to hang out with. "Rather, there is a direct, causal relationship. What appears to be happening is that a person becoming obese most likely causes a change of norms about what counts as an appropriate body size. "People come to think that it is OK to be bigger since those around them are bigger, and this sensibility spreads." Dr Richard Suzman, director of the National Institute of Aging's Behavioral and Social Research Programme, said the finding could have important implications. He said: "This seminal study breaks important new ground in showing how social networks may amplify other factors and help account for the dramatic increase in obesity across the [US] population." Dr Ian Campbell, medical director of charity Weight Concern, said it was no surprise that people who are obese tended to be friends with others who were obese, but that the fact that the link was more important between friends than siblings was "very interesting". He said this suggested that social factors were even more important than physical ones in obesity. He added that, on the positive side, if overweight people had friends who were obese, they could offer moral support to help each other lose weight. But Professor Andrew Hill, of the University of Leeds, said it was purely speculation to suggest that people's body images change because their friends become obese. And he said it was important not to forget things which are known as key factors in obesity, such as diet and exercise. 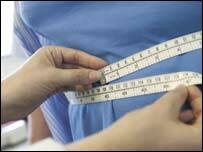 "The statistics may be meaningful, but in real life this is not very helpful to people who are overweight. "We don't have an understanding of what is really causing the relationship - it might be very complicated."